January is NSAA Safety Month. 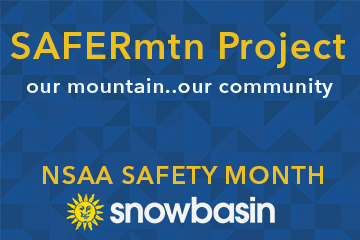 We will be using January to kick off a new initiative at Snowbasin Resort -SAFERmtn Project. We invite the community to get involved with keeping our mountain safe. Throughout the month of January we will be posting safety facts on social media to remind everyone 'how to be safe' on the mountain. Plus on the weekends we will have 2 safety booths, where you can talk with our employees about Terrain Park Safety, Snow Safety, Sun Protection, Chairlift safety and more. The bottom booth will have a spinning wheel encompassing all these topics. Spin the wheel for a chance to talk about a mountain safety topic and win fun prizes. The top booth will be hosted by our awesome Ski Patrol. If you prove you 'Know the Code' by reciting it to them, you have a chance to enter the raffle or get another prize. If you enter the raffle, we will draw winners on Sunday afternoon and contact you if you win. The last weekend of the month will be focused on snow safety and avalanches with lots of avalanche safety specific programs. 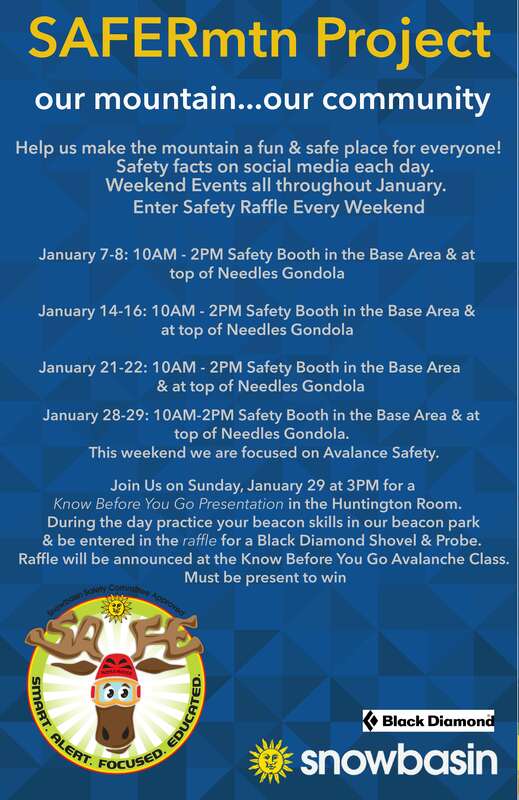 January 28-29: Safety Booth top and bottom of Needles Gondola 10am - 2pm In additon to the regular safety booths, the beacon park will be up and running to practice your skills, the avy dogs will be doing demonstrations and Sunday afternoon 3pm-4pm Snowbasin Resort Ski Patrol will be sponsoring a Know Before You Go Avalanche Awareness Lecture for free. If you practice your beacon skills throughout the day you will be entered in a raffle for a chance to win a Black Diamond Shovel and probe. You have to be present to win.